A more generous version of the economic stimulus plan than the one proposed by US President George W Bush has failed to find enough support in the Senate. Senate Republicans narrowly blocked the Democrat-backed plan, which would have provided extra money to retired people and veterans. The US House of Representatives has approved a White House-backed $146bn (£73bn) economic stimulus package. It was not immediately clear what action the Senate would now take. The Senate plan, worth $157bn, was backed by some key Republican senators. But the Democrats narrowly failed to get the 60 votes they needed to end the debate and move the bill to a final vote with the tally at 58 to 41. The Senate's version reduced the tax rebates on offer in the original package but extended the group to benefit from these. It also expanded unemployment benefits, offered heating aid for the poor and gave tax breaks for renewable energy firms and coal companies. Senate Democratic Majority Leader Harry Reid criticised Republicans for blocking the bill. "Given a chance to act as a recession looms, more than 40 Republicans said no to helping 20 million seniors and no to 25,000 disabled veterans." But US Treasury Secretary Henry Paulson had earlier expressed scepticism about some of the add-ons, urging Senators to keep the stimulus measures focused on simple tax breaks. "I'm concerned if we see things that aren't stimulus and aren't going to get money to the American people quickly, we'll get bogged down," he said. Under the president's proposed package, some 117 million US homes would receive a rebate of up to $600 for individuals and up to $1,200 for married couples. Couples with children will also get an extra $300 per child. The tax rebates for households should total $100bn, while businesses will benefit from up to $50bn of tax cuts. It follows the Federal Reserve's decision to slash US interest rates to 3% from 4.25% over the past two weeks, the most aggressive move for many years. Economists say the stimulus package needs to be put into action as soon as possible, before it is too late to help the economy. The latest figures show that US economic growth fell sharply in the final three months of 2007 to an annualised rate of just 0.6%. 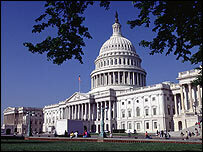 Congressional leaders have vowed to send a bill to the White House by 15 February.